...I eventually came up with a corny, Raymond Chandler/Gumshoe-style detective story, involving her mum and 2 sisters, as well as me, and I burnt it onto a disc. Click on the disc cover (Opera, Safari, I.Explorer) to download the show, or right-click on it & choose Save Link As... (Firefox). The show will open in PowerPoint. You can move from slide to slide by using the Left & Right arrows, Enter or Page Up & Page Down; your clicking speed will also speed up the show. 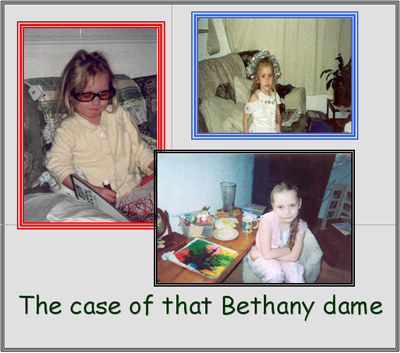 make sure your speakers are on: the soundtrack was some of Bethany's favourite tracks at the time. Press Esc at any time to stop the show. Copyright © 2005/6/7/8/9 by Denis Murphy. All rights reserved. Revised: 04 Oct 2012 03:56 .